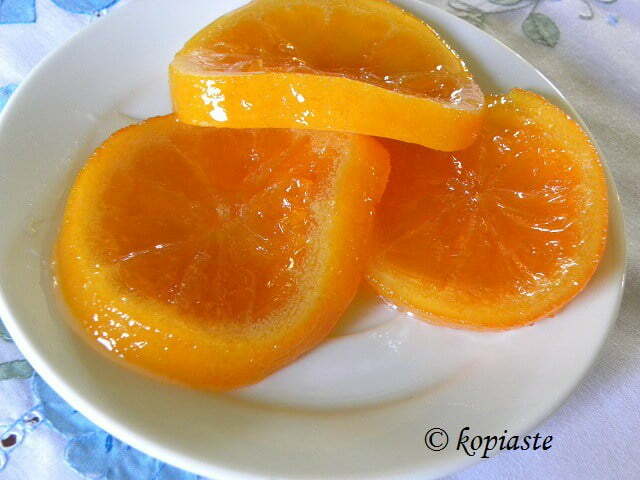 Glyko Portokali (orange fruit preserve) is one of the most popular Greek preserves. The traditional way of making “glyko portokali” is by using the peels making them into rolls, whereas this one uses the whole fruit..
You can find the method of making the peels into preserve, by following my recipe for Bergamot Preserve. Traditional way of making the preserve. Living in a place where citrus fruit is cultivated everywhere, there is such an abundance of fruit which makes it very cheap. Many farmers do not even bother to collect the fruit, as it costs more to collect them than selling them, so they end up rotting on the trees. We have three different citrus trees in our garden (oranges, mandarins and Seville Oranges (bitter oranges). We have also grafted a few branches to become lemons and bergamot but they have not yet produced any fruit. Although we eat oranges and mandarins every day, the trees are still packed with fruit. I made a mixed citrus marmalade, which is different from the one I have already posted as the main citrus used is bergamot (recipe to be posted in another post). This year, I decided to make this orange fruit preserve, using the whole fruit. This was my first attempt in making it whole, which is much trickier than just using the peels as you need to get the syrup density right, without mashing the fruit. You can serve the preserve as it is or mixed in Greek yoghurt, to incorporate it in recipes or just to decorate other desserts. Here are some older recipes using Orange Preserve. You will find the links at the end of the post. Wash the oranges and when they dry, grate a thin layer of zest. Put them in a pot with a plate on top, to keep them submerged, and cook for fifteen minutes. Set aside to cool. Discard water and add fresh water. Bring to a boil and cook for fifteen minutes. Repeat this procedure two more times or until the oranges become soft. Put them in a colander to drain. In the meantime put all the syrup ingredients, except the lemon juice, in a large pot. Stir until the sugar dissolves and put it on the heat. Bring to a boil and then simmer for about 20 minutes or until the temperature reaches 103oC. Cut the two edges of the oranges and discard. Cut the remaining oranges into five slices and put it in the syrup with any orange juice. Cover them again with a plate. Bring to a boil and simmer until the syrup reaches 104oC. Remove the plate and add the lemon juice. Set aside to cool and store the preserve in sterilize jars after discarding the spices. - To make the preserve, a thin layer of citrus zest has to be removed. I store the leftover zest in the freezer to use in cakes etc. - The fruit is boiled whole several times to remove some of the bitterness but also for the peel to become soft. - The sugar syrup is prepared ahead so as not to boil it simultaneously with the fruit, in order that the fruit will hold its shape. - When the fruit is added in the syrup, some of the juices of the fruit will come out, so you must make sure that the syrup is properly thickened. The syrup will set as it cools, so let the syrup cool at least once and check its density again. I made a small dose of Victoria Sponge, which was cut in the middle and was wet with orange preserve syrup. I whipped some heavy cream, with icing sugar and a drop of orange essence. In half of the whipped cream I mixed some finely chopped orange preserve which was sandwiched between the sponges. I covered it with the remaining whipping cream and decorated it with orange preserve and some chocolate shavings. Thanks for sharing this recipe, Its relly seems to be yummy!! Ivy, what a wonderful treat for oranges! What do you think – I am afraid for overcooking of oranges , so they do not become too soft and not crushed during cutting.